How would you feel if the money that supports you were given directly to your landlord, your doctor, your grocer, and your local bus system? Would you feel like your independence and control were compromised? I would. I like the fact that I can chose where my money goes, and what I do with it. So I'm going to propose we turn the financing of homeless service programs into what we all expect for ourselves. What if we issued debit cards to everyone we serve, filled them with the funds we provide to our service organizations, and equipped the organizations with payment acceptance devices which additionally provided our system with the important service management information necessary for quality improvement. Serving our customers and allowing them to provide the kind of feedback that incentivizes private businesses toward excellence, would seem a more effective means of insuring client-centered and focused services. Additionally, it moves us significantly forward in unifying our reporting systems to improve collaborations. The technology is already here todo so. Smart phones with charge cubes process credit cards for all of us, and backend databases analyze our movements and support our needs. I'll bet there's a silicon valley startup which could be harnessed for this social benefit. But that's not the key question. Is the homeless service community ready and wiling to respond to their homeless clients in the same way that the rest of the world responds to us? BACKGROUND: The Southwest Voter Registration Education Project (the “Education Project”), through its attorney Kevin Shenkman, has submitted a certified letter challenging the City’s at-large election of council members. The Education Project alleges that racially polarized voting within the City has combined with the City’s at-large election system to impair the ability of Latino voters to elect candidates of their choice or to influence the outcome of an election. The Education Project thus alleges that the City’s at-large election system may violate the California Voting Rights Act, and it threatens litigation if the City does not voluntarily transition to a district-based election system. Attorney Shenkman has submitted similar claims against cities, counties and school districts throughout California. The City Attorney recommends that the Council give direction as to the appropriate response to the allegations. RECOMMENDATION: It is recommended by the City Attorney that Council state its intent to respond to a legal challenge, brought under the California Voting Rights Act, to Santa Rosa’s at-large voting system. Council action may be by: 1) Motion directing staff to research and defend against claims that the City’s at-large election system violates the California Voting Rights Act; 2) Resolution stating Council’s intent to place a measure on the ballot in June 2018, or as soon thereafter as is practical, proposing an amendment to the City Charter to transition the City to a district-based election system, and directing staff to undertake associated actions; 3) Resolution stating Council’s intent to transition to district-based elections by ordinance adopted pursuant to Elections Code Section 10010 and Government Code Section 34886, and directing staff to undertake associated actions; or 4) Motion directing staff to seek declaratory relief in Superior Court. This Tuesday's Santa Rosa City Council Agenda's last item is an earth-shaker. BACKGROUND: On July 17, 2017, the City received a claim alleging that the City’s at-large election of councilmembers is in violation of the California Voting Rights Act. RECOMMENDATION: It is recommended by the City Attorney that the Council, by resolution, state its intent to respond to claim regarding the City’s compliance with the California Voting Rights Act. " We might as well declare a political emergency, and admit that everything else the City is doing is now on the back burner. The City has 90 days to act if it wishes to avoid the payment of large legal fees, and the imposition of district election boundaries by a judge. Please check it out, and join us in making the City's latest housing development work a success. if you have questions, or just want to follow along as the process unfolds, contact Homeless Action! · Rogers – Diversion supported for mental health and substance use, Portapotties, Disruptive not homeless, Impact on Jobs & youth. Smoking, graffiti – Yes. Sleeping in cars? Alcohol & Drugs – services! Restorative – SF QOL, More nuanced manner. · Coursey – Homeless Court?, not the only tool being used, housing not jail, use it sparingly, alternative outcomes. · Sawyer – Police Training?, Portapotties, What have we accomplished?, data quarterly. · Combs – Concerned about costs, Homeless Court, Data – Impact on Homeless, Beds Available, especially for ADA, PTSD, DV, MH. Concerned about arresting for use of public spaces hen no private paces are available. Trouble charging for sleeping, urinating when no facilities available. Concerned for 12yr old boys, PTSD, DV, MH, Fathers w/Daughters. No total costs, diversion, and data. 1. Although the Overview lists Public and private agency stakeholders, there is no indication of who is on the Steering Committee, or who is representing each agency. Can we get this information? Although the Overview mentions that SRHC is a grassroots organization, there appears to be no participation by the homeless, homeless advocacy groups, other citizens, or neighborhood organizations. Can we get clarification on current citizen and organization membership and participation? 2. What are the charters and current status of work of Workgroups 1-3 and the ongoing agendas for Workgroups 4 & 5? See below for Workgroup summary. 3. What is the “continuous communication” plan indicated in the overview? And how can interested stakeholders and citizens follow the work of the group? Goal 5 of the Overview speaks to: Develop processes of system accountability consistent with Goals 1-4. The Accountability Workgroup 3/29 Reports that The purpose of the Accountability Workgroup was to research, analyze, and recommend best practices to hold the service system accountable to ensuring that frequent utilizers of the criminal justice and emergency response system are served, and to identify the portion of those who are service resistant and how their actions might negatively impact the community, including others who are experiencing homelessness. 1. There is no indication of authorship of the Workgroup 5 3/29 report. Who participated in this report? Why was the focus changed in the way it was to focus on criminal justice responses? 2. There was no documentation of “best practices” or evidence-based research to support the recommendations in the 3/29 report. Can it be produced? 3. Will the Workgroup continue to develop policies and procedure recommendations for the Jail, District Attorney, Probation, City Attorney, etc. to address this population? 4. Is the Accountability Workgroup going to work on accountability as described in their Overview? Set up teams of 2-3 for each appointment. One person should mostly take notes. We will focus our conversation in these areas, without trying to get all these questions answered. Different questions are a better fit for different council people. --Determination to get specific cost and efficacy—do the Council members have that now and/or want it after this change is passed? --What is the measure of success? What are your expectations if you pass this measure? What problem are you trying to solve? What evidence have you gotten that this change will solve these problems? What impact will this have on homeless people? We need a survey of their reaction to this proposal? 2. What are the questions you want answered by Staff? --The “Justice” question. If you want diversion and restorative justice to be the main outcomes of this change, how will that be implemented? What will you do to monitor that that outcome? --The “money” question: How do you reconcile housing 50 people at a cost of $1.2-4 million, and then putting 700-950 people in jeopardy. (950 reflects research that shows approx. 25% of Californian homeless people are uncounted) What are you willing to spend on this new enforcement effort? --The “Data” question: [Gerry says we need transparent baseline data before we can measure any success—find out what he means specifically] Are the number of infractions for so called homeless offenses changing over time? Increasing? Decreasing? --The “Contract” question: Look at the past quarterly reports from Catholic Charities. ($3 million for housing 100 people) Ask if they are willing to have ‘outcome-based contracts, rather than ‘process-based’ contracts and, if so, how will they ensure that happens. --The “Success” question: Is there evidence that increased fines and jail time will make any positive change? If you pass this change, what measure of success are you looking for? What kinds of reports will you ask for? How often? --The “Integration” question: How does this “Quality of Life” issue integrate with the “Emergency Declaration” and other actions the city is taking related to homelessness? (The Homeless Action Plan?) Does it serve any function in getting people into housing? --The “Who is Pushing This” question: Does this primarily come from the Homeless Collective? If so, who specifically sat on the ‘Accountability Committee’? What self-interest, if any, was involved? 3. What about the ADA (Americans with Disabilities Act) & domestic violence victims? Are there open shelter beds to serve people with disabilities, both physical and mental? People with PTSD and other mental health needs that are triggered by crowded settings? Victims of domestic violence who can’t be around their abusers and/or men at all? 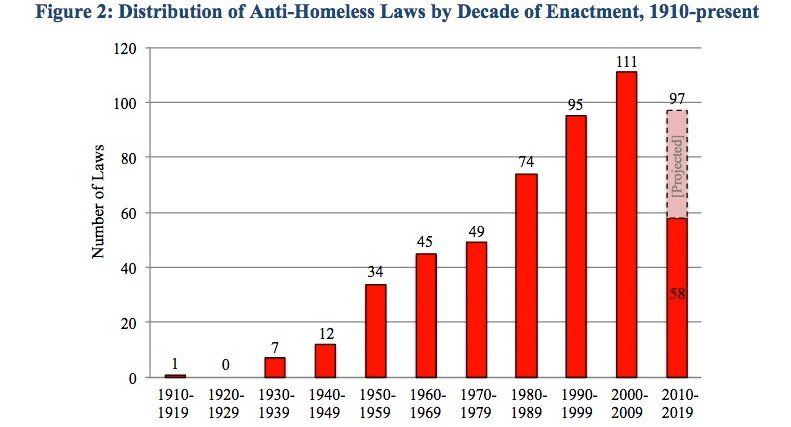 Increased enforcement illegal without having shelter available? Housing First. No evidence the folks from Homeless Hill will get housing until Jan and then it’s preliminary. Crowded. Old building… Questions of fairness: Is it fair for someone who is “committing a crime” to step ahead of a person who might be 100th on the wait list? Do you know what the waiting list time is at the various shelters? 5. How are you implementing the Vulnerability Index part of Housing First? How many on Homeless Hill were the highest priority on the Vulnerability Index? 6. Sept 26 joint meeting with County and City. Meeting on the 26th has been changed to be a Study Session where the City Council hears a presentation from Homebase (the consultant hired to review the system of governmental decsion-making concerning homeless services, and its compliance with Housing First and HUD principles, and make recommendations). The joint meeting of the City and County has been put off until November. --Enforcement will increase the visible numbers of homeless people around the county as people attempt to get away from Santa Rosa cops. --What has the Council requested of you in regards to a Memorandum of Understanding through the District Attorney’s office? --What are the important issues for the County, District Attorney and jail? --How much increased police activity cost? Where will the increased funding come from? --How does the role of the Homeless Court fit into this “new” model? --How would “diversion” affect current homeless services including shelter beds. --Questions of fairness: Is it fair for someone who is “committing a crime” to step ahead of a person who might be 100th on the wait list? --How will fines or jail times be tracked and will this data be available to the public? --Will restorative justice be utilized and, if so, how would that be defined and accomplished? --How does Homeless Court fit into this “new” model? Update about homeless court. How much is it doing? What is the demand for it (backlog, waiting list)? What are the most frequent agencies or case workers who refer people to homeless court? Will you write a letter and/or testify against this change? Sometime between 8 am and 11:30 am this morning, the police and Catholic Charities staff threatened between 14-22 residents of Homeless Hill with arrest if they did not leave their homes. By noon, when members of Homeless Action! arrived, this micro-village was destroyed. We were told that there were no arrests. One man who didn't make it entirely easy, but most complied with police instructions. Everyone went either to the Sam Jones Shelter or were given motel vouchers*. We will check with people who were there to confirm this. Between 9 and 11 Hill residents had already moved to Sam Jones over the last couple of weeks. There were 42 residents on the Hill originally. Some people left before the police came and scattered. We saw a very sad scene with most of the tents collapsed and various household items strewn about. The camp looked as though it had been abandoned in the face of a natural disaster. We did not see the most personal items among the wreckage, so we're hoping that people had prepared themselves with a back pack or a few bags. There was an altar of flowers, a cross and a grieving plaque near the top of the hill. 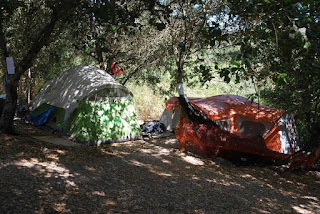 Many use-able tents, bedding, sleeping pads, clothing and other household items remain. Our experience with other "clean ups" is that everything will be dumped into large trucks and taken to the landfill. The Homeless Action! team had hoped to help people move out carefully, folding and storing some of the use-able items. Instead, we were threatened with arrest for trespassing and escorted off by uniformed cops. Our ally, Michael Anthony, was there from 7-8 am but we all missed the moment in terms of being able to witness the destruction in process. Thanks to you all for being willing to step up and defend some of the most vulnerable humans among us. I'm very sad. Perhaps it seems over-blown to name this a micro-village; perhaps the trash seems to justify this trauma. But, I think that this place was a home for 42 people, who lived together and tried to make each other more secure. I think of the trauma and emotional suffering of those who have lost so much of what they built and I honor them. In June of 2016, California cities led the nation in enacting and enforcing anti-homeless laws. 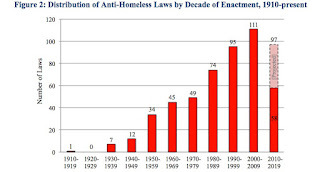 (see attached chart) Santa Rosa with its liberal image has the same number of anti-homeless laws as conservative cities like City of Orange in Orange County, Ventura and Redondo Beach. On Tuesday, Aug 8, 2017 the Santa Rosa City Council, staff and Police moved forward with increased penalties for offenses frequently charged to people who are homeless. The offenses were labeled “quality of life ordinances.” Although citizen outrage was strong and loud, 6 of the 7 councilmembers agreed. Quality-of-life ordinances are seen to be strong medicine. Advocates for the homeless found it to be an effective emetic. The phrase "Making bricks without straw" * comes to mind hearing how much is being taken away from those who are homeless, making their lives more miserable, despite homeless advocates' protestations. What is becoming my only hope in this situation is that the courts will deliver, "with a strong hand and an outstretched arm", the justice we cannot seem to. When did the police become a "tool in the toolbox" of the city council? How has that point of view become prevalent among them? What in the make up of the council allows this bias towards the use of police force to solve social problems? Where does this easy coziness come from? The police are to serve the law and justice, not to be the strong arm of a weak council. It will not work. Though these are called quality-of-life ordinances they are clearly aimed at the homeless as a group. Why else the need for increased enforcement? Are there more tourists crapping in alleyways and storefronts? Are more college students sleeping on park benches and in underpasses? Are grandmothers panhandling again? Of course not. It is that other group. These are plain old vagrancy laws from the 1930’s. This time the sign 'No bums allowed. Keep moving', is not posted publicly. The homeless are not vagrants. 86 percent of them are Sonoma County residents on hard times. When there are so many other possible courses of action, why would the city council choose the one with so much legal risk attached to it? Why do they call upon themselves the "strong hand and an outstretched arm" of the courts? How much better it would be if they chose to just be nice and neighborly? It is so much more cost effective. Who has given them this poor and questionable legal advice to follow a path that will only lead to court? And has not that outcome already been decided when in Boise, Idaho, 2015, the Justice Department warned that local laws criminalizing homelessness could violate the Constitution's protections against cruel and unusual punishment? And the more recent 2016 9th District Court case, Cobine vs. Eureka Police Dept., where among other things it was found, "The Court recognizes the public interest of protecting the public health and safety as well as preserving the environment and affording the City the benefits of a nature trail. The Court also, however, recognizes the public interest in maintaining the protections afforded by the Constitution to those most in need of such protection. The Court finds the public interest weighs in favor of Plaintiffs." Referencing another case they said, “Unlike monetary injuries, constitutional violations cannot be adequately remedied through damages and therefore generally constitute irreparable harm.” You can see the rabbit hole we are about to go down if we follow this transparently discriminatory city policy. Look, the business owners are right, it is wrong and a shame that in Santa Rosa people must defecate in alleys, parks, and store fronts. The homeless are right when they say nobody wants to do that, but in extremis where else is there? And when does that act become a protest to an outrageous state of being? Civil rights activist Bayard Rustin said, "When an individual is protesting society's refusal to acknowledge his dignity as a human being, his very act of protest confers dignity on him." This situation was not created by the homeless. This is what happens when a city council fails to respond adequately to a serious social crisis. This friction, this conflict, is in large part of their making. We did not blame the victims of Katrina in 2005. We rightly held our ineffectual public servants to account. a. Defendants must provide emergency shelter, not at the City-owned parking lot located at the corner of Washington and Koster Streets, for all eleven Plaintiffs beginning on Monday, May 2, 2016. Such provision is not indefinite and Plaintiffs' stay at any emergency shelter within the City of Eureka shall be subject to the rules and limitations of such shelter. viii. Defendants shall store Plaintiffs' personal belongings, packed and labeled in accordance with the provisions of this Paragraph, in one or more locked Conex storage containers to be located in the North 40 parking lot at the Bayshore Mall or at the City of Eureka Corp Yard. The Conex storage containers in which Plaintiffs' personal belongings are stored shall be used only to store items belonging to Plaintiffs, and not any other persons residing at the Palco March on May 2, 2016.
ix. Plaintiffs' personal belongings shall be stored by defendants for a period of no less than 90 days, at Defendants' expense, unless Plaintiffs request to claim and retrieve those items sooner. At the expiration of this 90-day period, subject to any further orders of this Court, Defendants may dispose of any items that remain unclaimed by Plaintiffs. There are so many other better, kinder, and more acceptable answers to our problems. In Exodus 5, Moses and Aaron [homeless advocates], meet with Pharaoh [city council] and deliver God's message, "Let my people go". Pharaoh [the city council] not only refuses but punishes the Israelites [the homeless of Santa Rosa] by telling his overseers [SRPD], "Ye shall no more give the people straw to make brick, as heretofore: let them go and gather straw for themselves", but still requiring the same daily output of bricks as before. The Israelites [homeless] complain to Moses and Aaron that they have now made things worse for them, and Moses in turn complains to God that every time he has gone to Pharaoh [the city council] on behalf of the Israelites [homeless], things have gotten worse for them. God replies to Moses [ homeless advocate] that the time will come when Pharaoh [the city council] will actually drive the Israelites [homeless] out of Egypt; and that on behalf of his covenant with the Patriarchs [Founding Fathers], God [the courts] will redeem the Israelites [homeless] "with a strong hand and an outstretched arm", so that they will know him. At this week’s meeting you’ll consider increased criminalization of homeless people with a change of certain minor crimes from “infractions” to “misdemeanors.” If you pursue this course, these offenses will be penalized with fines up to $1000 and six months in jail -- offenses that currently receive fines of up to $250. and no jail time. Five of the nine categories of offense are rarely committed by the housed, including obstructing streets, panhandling and camping (aka sleeping) in public. Although many of you call for evidence-based policy, in this case you are being given no evidence. What is the benefit of this change? Where is the evidence? The Santa Rosa Police Department is already involved in more aggressive enforcement efforts, making more arrests and giving more citations to homeless people. This change would give them another instrument of control. We know that arrests, high fines and jail time cause incredible harm to those without homes, as these things become a major barrier to accessing rental apartments. In your previous discussion of this policy we heard rhetoric about equal enforcement of the laws and that this will be enforced in a careful (even kind and gentle) way. But, these laws will not be enforced against friends drinking wine with a picnic or a young man who forgets to use the bathroom before leaving a bar. They will be used against those suffering in the heat and stigma of homelessness. Santa Rosa is considering formalizing another level of discrimination, and constitu-tional violations of the 4th and 8th amendments. We count on you to oppose this measure. This week, homeless in two California cities went to court to prevent localities from violating their constitutional rights. 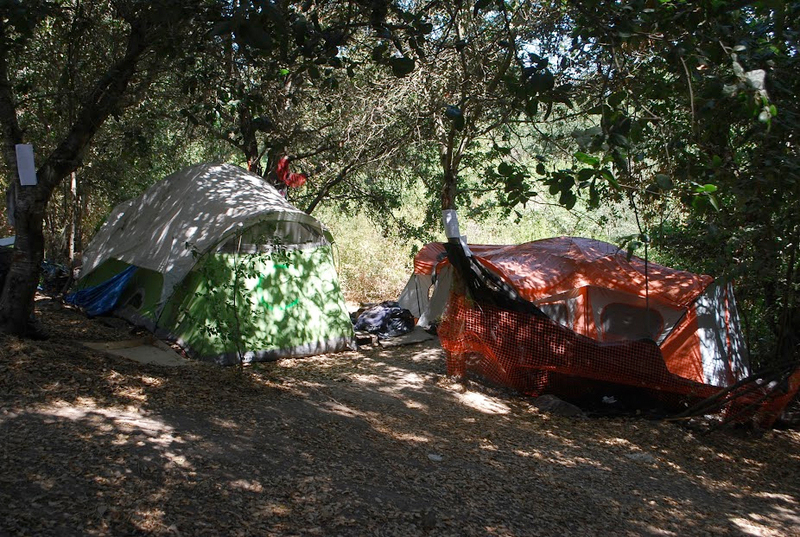 Homeless activists in Laguna Beach and San Diego have both cited a decision last year by U.S. District Court Judge Jefferey White in Cobine vs Eureka, which prohibited evictions of homeless from public places unless accompanied by placement in shelters and protection of their personal possessions. For a copy of the original complaint, download it from the article on the case in the Lost Coast Outpost on April 26th. Homeless Action! is studying the case.